Home to a wonderful array of flora & fauna, but are you brave enough to take on the rope bridge? Carrick-a-Rede is home to a wonderful array of flora and fauna, but some of the best views are awarded to those brave enough to take on the rope bridge. Carrick-a-Rede is recognised as an area of special scientific interest for its geology, flora and fauna. There is plenty of wildlife to spot here, from basking sharks, dolphins and porpoises in the sea to the fulmars, kittywakes, guillemots and razorbills that breed on the islands close to the rope bridge. The famous rope bridge is reached by a short coastal path with wonderful vantage points along the way to stop and take in the natural beauty. The name Carrick-a-Rede comes from the Scottish Gaelic ‘Carraig-a-Rade’ meaning “The Rock in the Road” – an obstacle for the migrating salmon as they searched for the river in which they were born. Atlantic salmon has been fished at Carrick-a-Rede since 1620, but it was not until 1755 that the first rope bridge between the mainland and Carrick-a-Rede Island was erected to reduce reliance on a boat to reach the island. Suspended almost 100 ft (30 m) above sea level, the Carrick-a-Rede Rope Bridge crosses a 20m-wide chasm between the mainland and Carrick Island. The rope bridge originally consisted of a single rope hand rail and was first erected by salmon fishermen over 200 years ago to check their salmon nets. Today the bridge attracts brave visitors looking to take the rope bridge challenge. Even though the single rope hand rail has been replaced by a two hand railed bridge, the bridge is still a thrilling experience and brave explorers will be rewarded with stunning views. Once you reach Carrick Island, you will be rewarded with the sight of the diverse birdlife and an uninterrupted view across to Rathlin Island and Scotland. 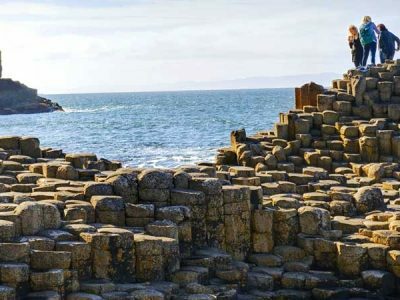 One of Europe's most spectacular coastlines, the Giant's Causeway is a spectacular natural landscape formed 60 million years ago. 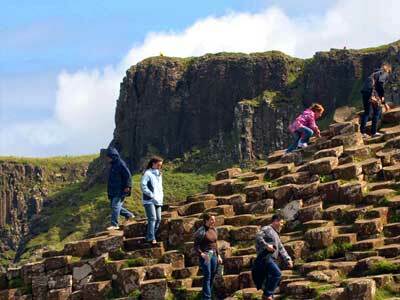 Or is it, as legend has it, stepping stones built by the mythical Irish giant Finn MacCool?